What is IMAX all about?? - Technik Now! For the starters, lemme make it very clear to you guys, if you say that you have had the pleasure of experiencing three amazing hours in IMAX, there are 90% chances that you are lying without even knowing you are! To be exact, there are only 12 screens in India as of now who all qualify for the TRUE IMAX. In fact, even the official website list only 7 such locations across our nation ( 2 in Bangalore). Now, if we are done with the stats, let’s move on! ( Chill man, many more such amazing ones to come) So, let’s break this thing down – the magic called IMAX! IMAX – What is that after all?? The fact that the starting range itself is 400% more than the standard version is more than enough to give that cliché “na bhai humse na hoga” reaction! For starters, it is NOT a movie format as many presume. It is NOT a dimension addition ( no no it’s not that 4D or something above). IMAX is basically a technique of shooting films with large cameras, on larger films and obviously, the final result comes to occupy the largest screens on earth. What and how the usage of such cams make this thing the so-called most immersive way to watch a movie, is something we will discuss in detail out here. What history books have to say on IMAX? 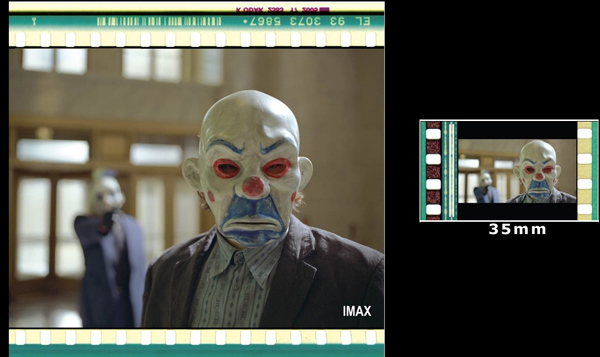 IMAX stands for Image MAXimum and was created in the late 1960s in the US for documentary filmmaking and was never actually intended for movie viewing at all. After all, using this mode of filmography is toooooo costly. In fact, IMAX cameras have been used while orbiting the Earth, climbing Mount Everest, exploring the bottom of the Atlantic Ocean, and visiting the Antarctic. Whats the science out here? Whenever you sit in a theatre and watch forward towards the screen, you see a lot many other things alongside the screen as the total visual field of our eyes is really huge. The basic idea behind the IMAX is…..
Yea…. the basic idea behind the birth of this thing was to make the screen big enough to exactly fit in this visual field so that all you see is the movie only and nothing else from the around. Also, to be precise, the IMAX Corporation is a Canadian theatre private company which manufactures IMAX cameras, projectors and is involved in IMAX movie distribution worldwide. Just imagine sitting out there! For starters, this is what makes IMAX what it is. The very essence of it! The BIG( and really really big!) screens. And some of them even are comparable to a 7-storey high building( e.g IMAX Melbourne, reportedly the largest on the face of the earth has a height of 23 Meters😎). It’s not only the screen size that does the magic, but also the theatre geometry puts in a lot of effort to make sure that its worth your money. The theatres are designed in such a way that they not only bring the audience closer to the screen but also make you feel to be a part of it. A lot of science and logic goes into placement of each and every row. IMAX film stock aka reels! Excuse me for the picture quality, but still, it is quite evident what makes this thing so popular. The conventional film reels are 35 mm i.e. 3.5 cms wide (even smaller than an average little finger). These are still used by many directors even though the trend is Digital Cinema instead of putting it on a reel. Wanna know the difference? Click here. Also Read : Digital Cinema – How movies are screened these days! The film used in cameras of this format is exactly a square of 70 mm i.e. 7 cms (half of a scale!) Just compare the size and you will get the difference. After all, you need the actual picture to be gigantic if you intend to put it on a bigger screen. These are very heavy, very loud and takes a lot of time to process the reels. Now just imagine using these big beasts to shoot a car coming at you at the throttling speed of 100 miles an hour!! You get my point! And due to this reason, no movie has ever been ever shot completely with IMAX cameras. The god out here is Christopher Nolan, who in 2012, planned to shoot The Dark Knight Rises entirely in IMAX but ended up doing just the one third. But in Dunkirk, this guy flipped the numbers!! The epic stuff out here would be the release of MARVEL’S ‘AVENGERS: INFINITY WAR’, whose both the parts have been decided to be shot completely in IMAX only. See here. Click to know about the earth-shattering speakers used in such theatres👈. There is not even a single inch of the theatre which doesn’t qualify for a sweet spot. That’s how perfectly the whole speaker setup is calibrated. These theatres use really huge speakers which are capable of producing earth-shattering sound quality and still be humble on your ears. Amazingly most of the IMAX theatres have speakers behind the screen and the screen material is as such that it has got tiny holes in it so that sound seems to be coming exactly from the mouth of your favorite actress. You gotta just notice the arrows(and yea, Nolan again!!) [Image Courtesy: movies.stackexchange] Click to expand and read more👈. The biggest difference when it comes to projecting an IMAX stock on those gigantic screens is that out here the reels are fed horizontally instead of conventional 34 mm projectors wherein they go vertically. Due to the image being horizontal, the width of the image is quite large when compared to the restriction of 35 mm. This creates a superb illusion making us a part of the movie. When you are doing everything to perfection, why leave the biggest aspect of the business – projectors – untouched? The system uses two huge 2K projectors, weighing 2 tons ( around 1800 Kgs, yea Tata Nano! ), whose dual images are superimposed to light up the screen in such a way that dare your grey matter to miss even a single small detail. Now the million dollar question, How far is India in all this?? Amazingly this nation of ours which houses the biggest movie industry doesn’t have much to talk about in this field. The official site of IMAX lists…..
Yea, what I was saying was that these guys list around just 7 screens all over India which qualifies the IMAX standards🙄. If names are to be talked, Dhoom 3 was to be the first one to be released in IMAX, followed by Bang Bang! Here are the honorable mentions…. And not to forget the honorable mentions of Prasads IMAX of Hyderabad, supposedly the best place in India to buy popcorns for an IMAX flick. In fact, I have got this friend of mine who traveled all the way from New Delhi to Hyderabad for Dunkirk! Hope this much helped you out learn a little bit and from next time, if you see that IMAX logo on the movie posters, you will say to yourself that I know what that is exactly all about!! Next Article WPS – The Best Way to Hack the WiFi Router!